American Chain Gang, a feature length documentary, profiles the experiences of the prisoners and officers of the recently revived male chain gang and the world's first female chain gang. This film examines the conditions of these people as they participate in these intense and highly controversial programs. American Chain Gang, investigates the impact of the controversial practice of chaining inmates during forced chained labor. Five prisoners and two officers are profiled before, during and after their release from the chain gang, thus documenting the true impact of the modern chain gang. The documentary investigates this controversial prison policy through the words and actions of those who it most effects. 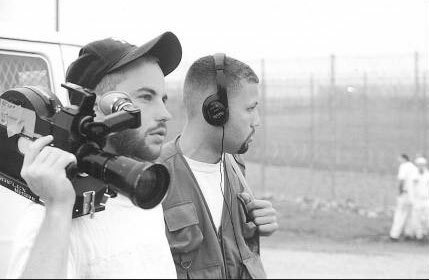 By giving equal time to both prisoners and corrections officials, the film provides an objective perspective of these environments. However, by presenting the long term effects of this publicity-driven and punitive practice, it ultimately documents the consequent futility and hostility of this controversial prison policy. "American Chain Gang is a bracing look at the resurgence of the work-detail in prisons, stopping first with the sweat-dripping all male chain gangs out straight out of Jim Crow before moving on to innovations like an all female gang in Arizona, a dubious first in the history of corrections." "Irving's documentary offers sad evidence of the increasing mean-spiritedness of American penology." "Sharply crafted," "American Chain Gang is a powerful, disturbing documentary about a practice that makes certain corners of the United States seem as enlightened as the Soviet Gulag." "Irving gives to his first feature-length film a true grasp of documentary style, economical and tough. His film provide an unblinking look at a harsh world that many of us never give much thought to, let alone see." Alabama and Arizona to make American Chain Gang.